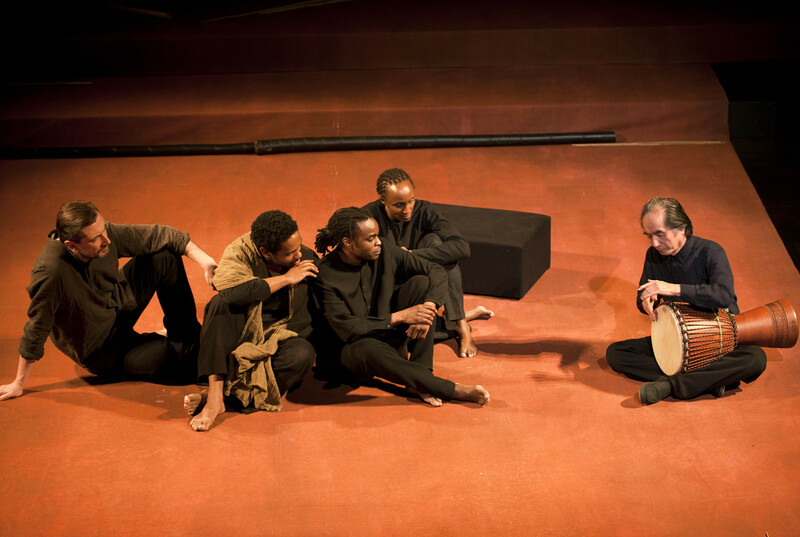 An encounter with the theatre of Peter Brook these days is not so much an escape as an audience with the Master, such is the reverence in which understandably he is now held. You have to pinch yourself that at 91, amazingly, he is still making international theatre. The kind of theatre Brook makes, too, is unique: as pure as a child’s soul, as wise as the oldest guru. Not I suspect that Brook would thank me for describing his latest import to the Young Vic in such hallowed terms. 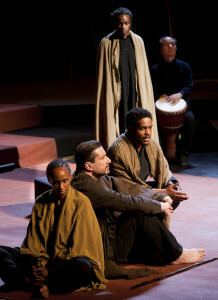 Brook’s professional career has been dedicated to the exploration of theatre. As the years have gone by, his style has become more and more austere, pared down to bare essentials. But equally, he has always been mindful of the indispensable element that makes theatre what it is – the audience and their enjoyment. 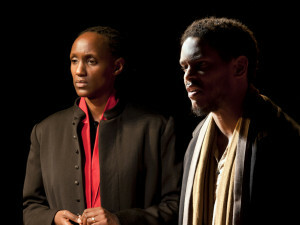 So solemnity goes hand in hand with mischievousness, nowhere better exemplified in Battlefield than after half an hour’s story-telling and a section describing a king giving away his wealth to the poor, the dread-locked Ery Nzaramba suddenly turns to an audience member and directly addresses him, with a twinkled eye asking, `are you poor?’. The man breaks into a smile and the audience becomes complicit. Suddenly, we are in the palm of Nzaramba – and the company’s – hands. Based on the Mahabharata and the play by Jean-Claude Carrière, Battlefield concerns a dynastic war between two families, the Kauravas and Pandavas, its deadly cost in terms of lives lost and its aftermath – the search for redemption and inner peace. Its relevance to today could hardly be more apposite and the style Brook adopts characteristically is one of storytelling, of allegory. Told on a simple dust-burnt stage with actors marked by vivid scarlet and ochre robes, the sense of the universal and timeless, of a ritual told in a temple from where the wisdom of ages is imparted, is unmistakeable. Majestic is the only word for it, not always moving in the sentimental sense but unquestionably something profound is being transmitted and given a haunting resonant otherness by Brook’s revered collaborator, the remarkable Japanese musician, Toshi Tsuchitori’s solo drumming. Battlefield is at the Young Vic Theatre to Feb 27.
Review first published for Reviewsgate, Feb 2016 and slightly amended here. This entry was posted in 2016, Reviews and tagged Mahabarata, Marie-Helene Estienne, Peter Brooke, Toshi Tsuchitori, war and inner peace, Young Vic Theatre on February 14, 2016 by Carole Woddis.